Mobilis in Mobile. Placed in the Nautilus as the Captain's monogram, is translated as "Movement through a Mobile medium", or "Mobile in the mobile element", or my favorite "In motion within motion." A slogan for water, space, cyber space, and the mental sphere. Don't miss the space petroglyphs at the bottom of the page! This 6 by 9 inch gold anodized plaque was attached to Pioneer 10 and 11 and left the planet in the early 70's. 30 years later they are passing the edges of our solar system. Around 1998 they lost battery power and no longer send back data. On the plaque a man and woman stand before an outline of the spacecraft. The man's hand is raised in a gesture of good will. The physical makeup of the man and woman were determined from results of a computerized analysis of the average person in our civilization. The Key to translating the plaque is in understanding the breakdown of the most common element in the universe - hydrogen. This element is illustrated in the left-hand corner of the plaque in schematic form showing the hyperfine transition of neutral atomic hydrogen. Anyone from a scientifically educated civilization having enough knowledge of hydrogen would be able to translate the message. The plaque was designed by Dr. Carl Sagan and Dr. Frank Drake and drawn by Linda Salzman Sagan. 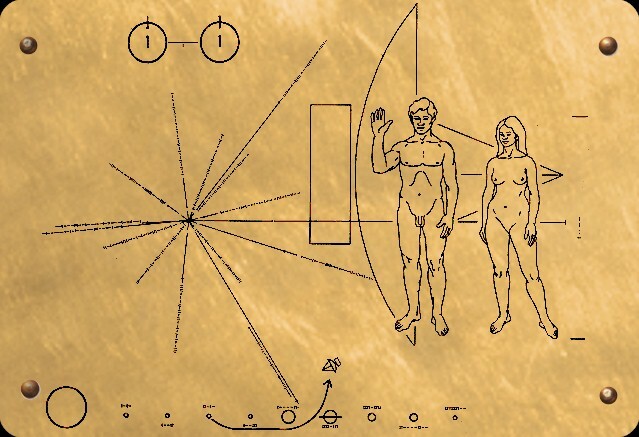 Included on both spacecraft is the small gold-plated aluminum plaque which the figures of a man and a woman are shown to scale next to a line silhouette of the spacecraft. The bracketing bars on the far right are the representation of the number 8 in binary form (1000), where one is indicated above by the spin-flip radiation transition of a hydrogen atom from electron state spin up to state spin down that gives a characteristic radio wave length of 21 cm (8.3 inches). Therefore, the woman is 8 x 21 cm = 168 cm, or about 5' 6" tall. The bottom of the plaque shows schematically the path that Pioneers 10 and 11 took to escape the solar system - starting at the third planet from the Sun accelerating with a gravity assist from Jupiter out of the solar system. Also shown to help identify the origin of the spacecraft is a radial pattern etched on the plaque that represents the position of our Sun relative to 14 nearby pulsars (i.e., spinning neutron stars) and a line directed to the center of our Galaxy. The plaque may be considered as the cosmic equivalent to a message in a bottle cast into the sea. Sometime in the far distant future, perhaps billions of years from now, Pioneer may pass through a planetary system of a remote stellar neighbor, one of whose planets may have evolved intelligent life. If that life possesses the technical ability and curiosity, it may detect and pick up the spacecraft and inspect it. Then the plaque with its message from Earth may be found and deciphered. The figure below the hydrogen atom shows the position of our sun compared to14 pulsars and the center of our galaxy (Milky Way) - the figure along the bottom is our solar system showing the origin of the Pioneer space craft from the 3rd planet.